What is Terpene? - YASUHARA CHEMICAL CO., LTD.
Home > What is Terpene? > What is Terpene? Terpene is produced in plants by biosynthesis, and is typically expressed as C5H8 with an isoprene structure. The primary ingredient is α-pinene, which for humans has the effect of being in a forest. It is believed to be one of the vital substances (phytoncide) on which plants rely to protect themselves against natural enemies. Terpene exists widely in nature. It is especially abundant in the essential oils of plants. 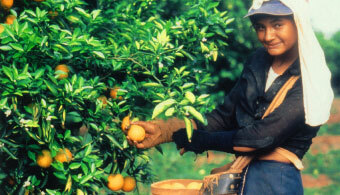 To sustain an abundant and stable supply for industrial purposes, it is known that terpene is extracted from the turpentine oil of pine trees and orange oil from orange peels. 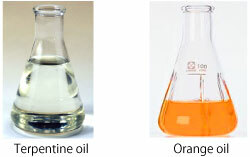 Orange oil and turpentine oil, unlike petroleum-based raw materials, will not be depleted in the future. 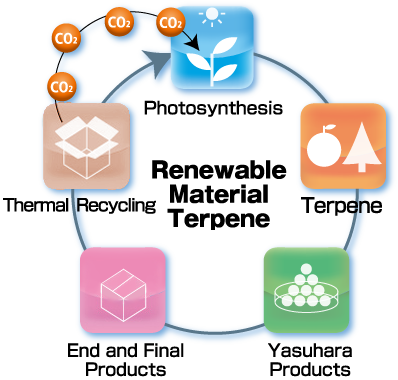 They are vitally important, renewable materials that are repeatedly produced through the energy of the Sun.